BIO ~ Cheyenne is a spayed female high-content wolf-dog which means she looks and acts like a wolf but has a bit of dog in her history. She came to Wild Spirit in 2004 when she was around 6 months old. PERSONALITY ~ Cheyenne is a very social girl who acts like a puppy no matter her age. She loves attention from caretakers, but she is mischievous. If her caretakers let their guards down, she will try to steal personal items from them. She is friendly but wild-spirited and not afraid to tell anyone that she is in charge. 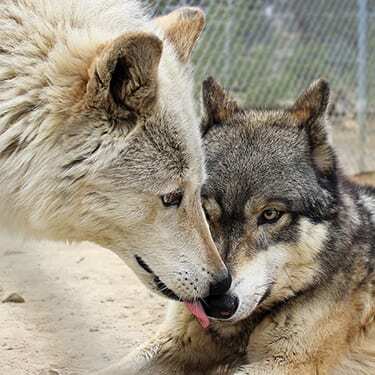 RELATIONSHIP ~ Cheyenne lives with neutered male mid-content wolf-dog, Argo. They are on the tour path, and Cheyenne will usually come down to greet guests. When she first arrived, she lived with high-content wolf-dog, Raven, until he joined the Big Pack in the Sky. LIKES ~ Cheyenne likes playing with caretakers, stealing articles of clothing from volunteers, and fence-fighting with her neighbors. She also likes splashing all the water out of her water bucket, usually right after her caretaker has filled it. DISLIKES ~ Cheyenne is usually a friendly and happy girl but will let caretakers know if they have pet her in the “wrong” spot. She does not like when Argo steals her food and treats. FUN FACTS ~ Cheyenne spent some time with the Artic and Artic-Timber rescues when they were very young, helping to teach them manners. She enjoyed all the energy and fun but had no trouble letting the pups know who was in charge. WISH LIST ~ Cheyenne is one of our oldest rescues. We keep our seniors moving like youngsters with special joint supplements. Please help us keep a steady supply with a tax-deductible donation from our AmazonSmile wish list. Cheyenne is Still Looking for Sponsors! CHEYENNE’S HISTORY ~ WSWS received a call from a man named Larry who worked for the Cheyenne River Sioux Tribe Fish, Game and Parks in Sought Dakota. He told us a little wolf pup was brought to the park service in a cage. Apparently, she had a few different owners before she was turned over. The park service was going to put her down, but Larry couldn’t sit by and watch that happen. He said he would take care of her until he found a place for her to live. For a few months, Cheyenne lived in a cage in his garage because she was such a gifted escape artist. At night Larry would take Cheyenne for walks and he and his kids would play with her. Larry met us in Nebraska, and although we had given Cheyenne an over-the-counter sedative, she immediately destroyed the inside of our transport van. The journey was long, but there were frequent walks on the way. When Cheyenne finally arrived at WSWS, she was overwhelmed by all the other canines. We thought she would be a good match for our rescue, Raven, who had recently lost his companion, Doska. Initially, 6-month-old Cheyenne seemed afraid of Raven. We introduced them on leashes outside of the habitat at first, to see how they would react to each other. All seemed well, so we let them go inside of Raven’s habitat. Very quickly, they got along very well together. After Raven joined the Big Pack in the Sky in 2009, Cheyenne was introduced to Argo, and the two are a great couple.